“You Can Change” is from her self-titled Burger Records EP. In The Verve's alt-rock radio classic, "Bittersweet Symphony," the lyrical mantra goes I can change, I can change. 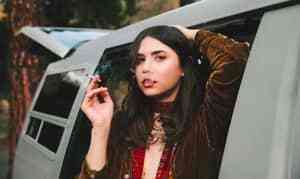 Stylish, joint-smoking newcomer Pearl Charles might speak in the second person on "You Can Change," but the dusty rock stomper has a two-sided emotional core, just like the controversial ’90s hit: it's rife with positive reinforcement, but still feels bittersweet. "I believe strongly in the power of manifestation and positive thinking," Charles told The FADER in an email. "But I know sometimes it's a lot easier said than done to have an optimistic outlook on everything, especially on those days when it seems like everything is getting you down. The end of the verses—but I just can't change your mind, but I just can't take what's mine, but I just can't make you mine—are that biting little reminder that we can't control other people's actions or reactions, only how we choose to handle the troubles life throws at us." The song appears on her self-titled EP, out July 28th via West Coast cassette enthusiasts Burger Records.